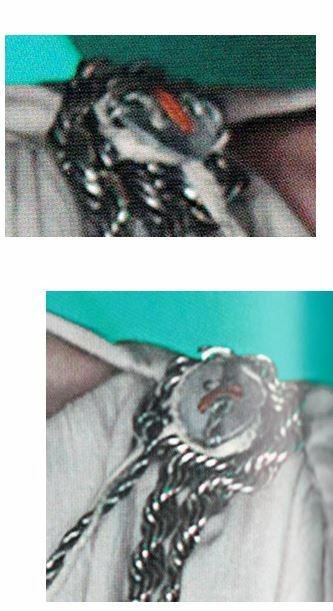 - A necklace consisting of two silver chains and a round, silver pendant, detailed as it appears in the movie, suspended in the center from three thin cords twisted together; one a thin silver roped cord, one cream or ivory, and one white. -One screen accurate, oval shoulder brooch with crossed cord accents worn on the left shoulder. -One screen accurate, rounded triangle shoulder brooch with 3 lines of cord accents worn on the right shoulder. -Front and back pieces pleated along the shoulder to match screen references. -Seam along the top of the arm from neck to wrist. -A large tuck at either elbow along the seam. -Poncho falls to knee or just above knee height. -Chocolate brown woven fabric, textured finish- crinkle preferred. -Ankle length dress with a full skirt. 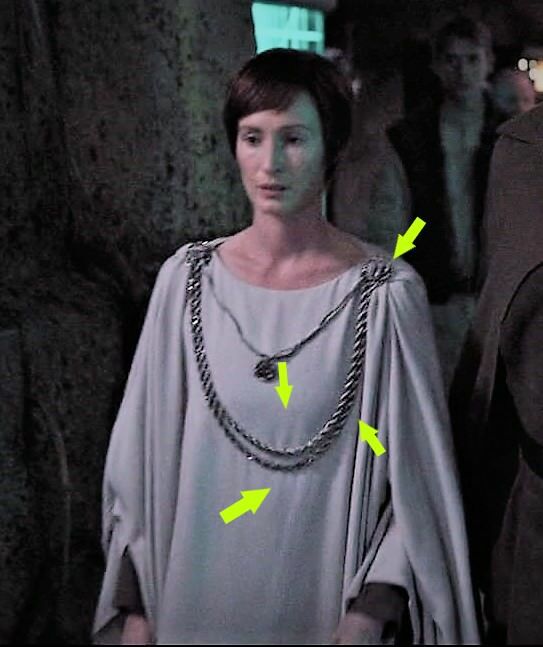 -Sleeves reach wrist, visible under outer poncho. It is really chains? Or some sort of cord? It looks like trim cord, but with a metallic finish. 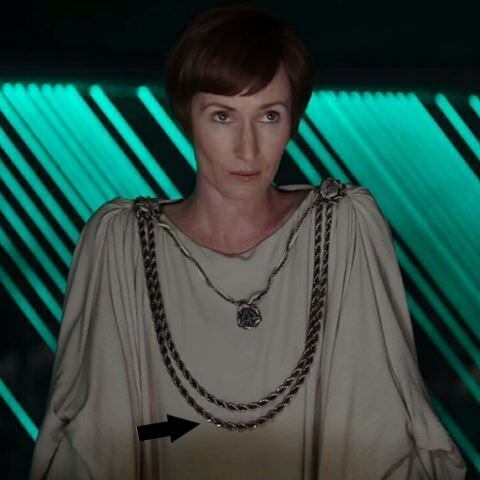 I'm pretty sure they used chains based on the way her poncho is consistently pulled forward and the glint off of the necklace. 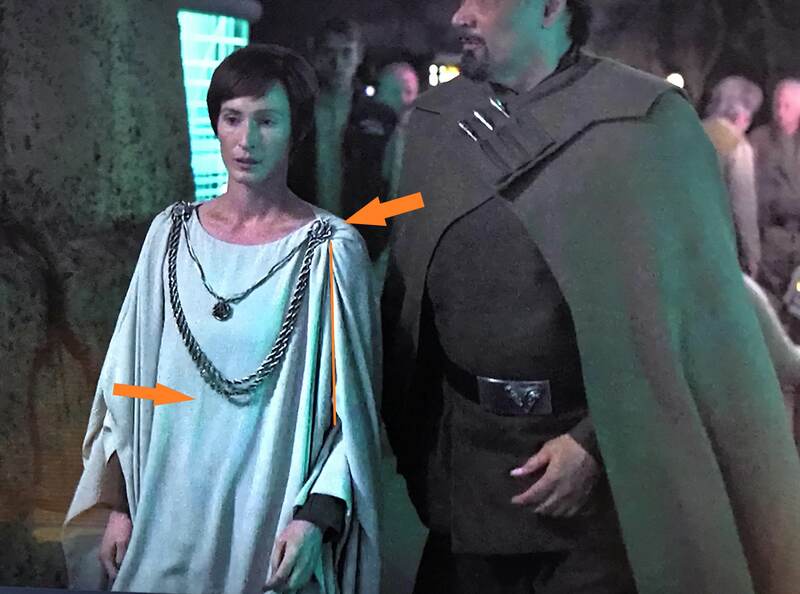 Why don't we say either is fine- as long as the roped cords are the true metallic silver color rather than the grey used in ROTJ? 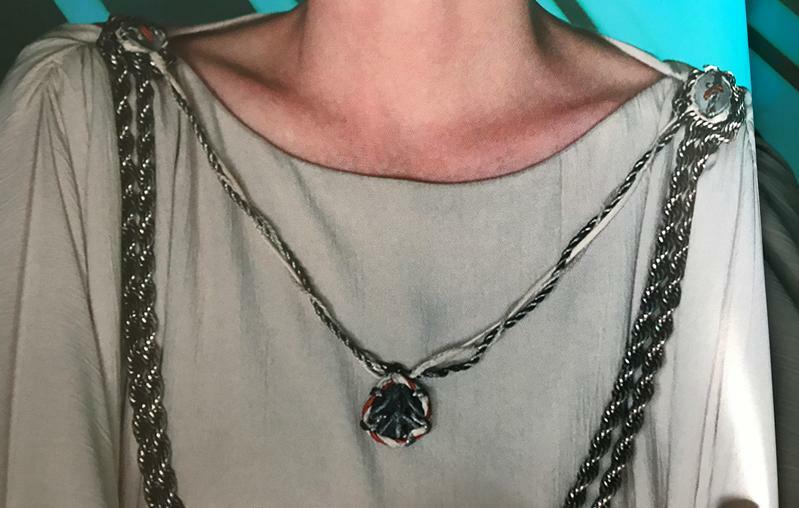 - A necklace consisting of two silver roped chains or silver metallic roped cording and a round, silver pendant, detailed as it appears in the movie, suspended in the center from three thin cords twisted together; one a thin silver roped cord, one cream or ivory, and one white. I totally missed this the first time I read your post! So sorry! You're right there is a reddish color mixed into the jewelry. I think it's a lighter brown that's reading on the redder side because of the way the pictures are lit? It's used in small bits on the shoulder brooches and entwined around the outside edge of the pendant, but not from the cords suspending it. The new standard format is going to have pictures of each element, which is why I though we might just say screen accurate? Trying to describe the cord detailing's placement and colors gets... complex and confusing-- especially for non-native English speakers. I thought this was approved nearly a year ago? I wrote up a version and had mine approved last April before Celebration and helped others with theirs. Was this not received ? It is included in my profile. I guess I am just confused by seeing this version after supplying one. I looked at your costume, and it appears it was approved based on references, not a standard. As far as I can tell, at least. It was never discussed and voted on. 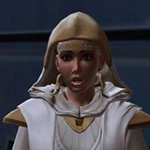 Notice has been posted to all base level Command Posts. 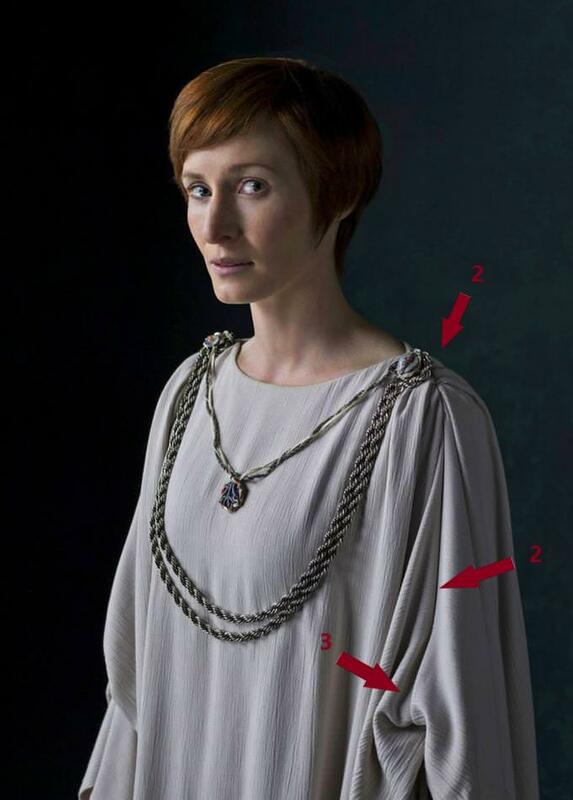 Hihi, can I know if the tunic is off white or very light grey instead? I've narrowed down the colours of the crinkle crepe here, center being the one I'm most likely to get: any feedback will be helpful thanks! It should be off-white. The middle is too gray. Actually, I disagree, Marie. In R1 there is a grey undertone to the fabric. 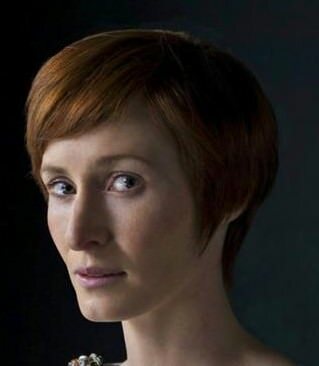 I think the middle fabric (in between the ref pics) in the picture she linked is just fine. It's hard to tell. It is a lot grayer in Rogue One than RotJ. I guess I pick the lightest grey they have? Rogue one version does look grey-ish. The costume reminds me of medieval liturgical vestments. I believe the inner dress is modelled after a tunicle and the outer a chasuble. Patterns for those are readily available. I agree that they are very similar. I would caution against using a tunicle pattern as the sleeves are much more fitted, and the skirt a bit fuller than typical liturgical garments. The chausible pattern it would depend. The pleats in the sides are not a feature typically used, and you need to take them into account when cutting out your fabric.